This sky map shows how the bright planet Venus, crescent moon and bright star Spica will appear in the predawn sky on Dec. 2, 2010 at 6 a.m. ET from the northeastern U.S. The triple sky show promises to dazzle skywatchers with clear skies. Ifyou've been up before sunrise during this past week and gazed at theeast-southeastsky, you may have noticed the return of the brightest of all planets,Venus, glimmeringlike a sequined showgirl with a silvery-white light. But if not, youmay wantto catch Thursday's triple sky show of Venus, the moon and a brightmorningstar. Theview, weather permitting, should be worth setting your alarm clock foronThursday (Dec. 2). At about 6 a.m. ET, there will be a beautifulconfigurationinvolving Venus, a slender crescent moon and the bluish first magnitudestar,Spica in the constellation Virgo. 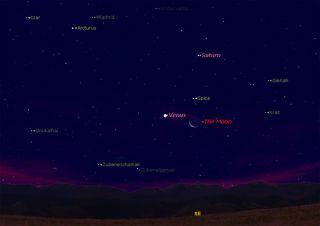 Thissky map shows whereto look to see Venus, the moon and Spica Thursday morning. Onthat morning, if you face southeast, you?ll readily see the moon,flanked by a brilliantVenus to its upper left, while Spica ? shining only about 1/250 asbright asVenus ? hovers almost directly above the moon. Fromlate February into early October, Venus was an evening object,appearing low inthe western sky soon after sunset. Now, it will keep earlyrisers company throughthe first half of 2011. Venuspassedinferior conjunction(appearing to pass between the sun and Earth) back in late October. Duringthe first days of November Venus was invisible, mired deep in thebrilliantglare of the sun. But around Nov. 4, it started making itself evidentin themorning sky, appearing very low to the east-southeast horizon about 40minutesbefore sunrise. Risingabout six minutes earlier each day, Venus very quickly became aprominentmorning object, climbing to glory in the southeast before dawn. By Nov.11 thebrilliant planet was rising about 90 minutes before the sun, and now itis risingmore than three hours before sunrise. Venusis always bright,but during December the planet's brilliance and altitude will beexceptional. Duringthe winter holidays, theplanet will shine like a modern-day "Christmas star in the east"before sunrise. Venusappears brightest Saturday (Dec. 4). Ifthere?s snow on theground and you?re in a dark, secluded location, check for faint shadowsmade byVenus' light. On clear mornings skywatchers should have little troublefollowing Venus right through the moment of sunrise. Bythe end of December, thislamp-like "Morning Star" will be rising during the dead of night,nearly four hours before the sun. InJanuary, Venus will continue to dominate thesoutheastern dawn sky. Theruddy first magnitude star Antares twinkles much fainter and well belowitaround midmonth. Venusrises within a half-hour of 4 a.m. (your local time) all winter andspring as seenfrom mid-northern latitudes. Between now andearly next summer,repeated observations of Venus witha smalltelescopewill show the complete range of its phases and disk sizes. The planet iscurrently displayingits distinctly large and narrow crescent shape, which should be easilydiscernable even in steadily, held 7-power binoculars. Venus willarrive at its greatestwestern elongation ? or westernmost point from the sun ? on Jan. 8,2011, andin a telescope its disk achieves what astronomers call dichotomy ? theappearance of being exactly half-illuminated ? a few days later. Forthe rest of the winter and on into the spring, Venus will appear to getprogressively smaller in angular size as it recedes from Earth whilegraduallybecoming more and more illuminated by the sun. Bythe end of June, it will be rising less than an hour before the sun andeven inlarge telescopes it will appear only as a tiny, featureless, albeitbrilliantdisk. Shortly thereafter, it will disappear into the solar glare,passingbehind the sun (superior conjunction) on Aug. 16 finally emerging backin thewestern dusk during next November, and especially December, of 2011. Finally,if the weather is cloudy or unsettled tomorrow morning (Dec. 2), thereis someconsolation in knowing that Venus and the moon will perform an encorelaterthis month. Venuswill appear with a slender crescent for the second time inDecember, and the moonwill once again form on the morning of Dec. 31, New Year's Eve. Onthat day, Venus will hover well above and to the left of the moon tohelp ringin 2011. JoeRaoserves as an instructor and guest lecturer at New York's HaydenPlanetarium. Hewrites about astronomy for The New York Times and other publications,and he isalso an on-camera meteorologist for News 12 Westchester, New York.